Before starting off, one should be sure about that the surface should be clean and should be well formed as it’s the base of the project so it should be perfect. Select the interior and paint for the surface which is about to paint. First, there should be a deep coat of latex burgundy paint as the base according to faux technique. 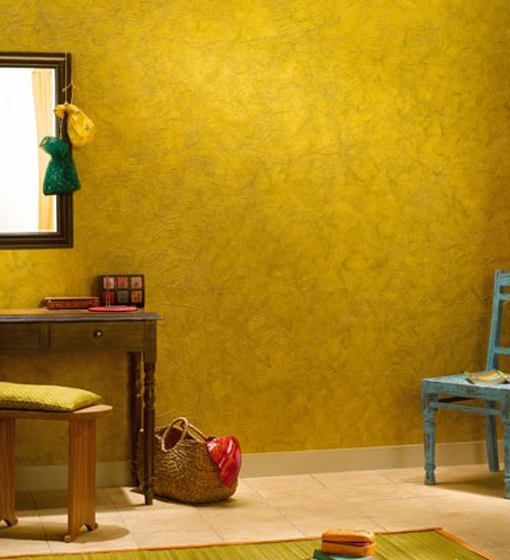 This technique has a wide range of glazes and base coats that could suit any home. Low sheen paints and egg shell works best for such decorative techniques. Before applying the technique on wall, one should have some foam boards and color combinations. After painting the boards, place each one of them on its specific place in the room to see different colors of lights. After completing the cutting around doors, ceiling, baseboards and corners, apply the basecoat on it. With the help of medium nap roller apply basecoat on it which minimizes roller tracks. As an advice use top quality paint which probably give the best coverage then allow it to dry. A latex glaze of deep tone paint (brown) is prepared in a ratio of 4:1 and poured into the roller tray that is already lined with a plastic liner. The reservoir of the tray is filled with the glaze and the flat portion will be used to offload the decorative instrument. Sea sponges are prepared by softening them in water and removing the excess water. These sponges are then placed or dipped into the glaze mixture present in the tray and excess mixture is offloaded by tapping the sponge in the flat region of the tray. The sponge is then applied on the wall in a random pattern to give unique texture. The glaze can either be used to give a ‘wiped’ look to the wall with the help of the sponge dabbing and angling the wrist or it can also give a ‘blotted’ look by using a smooth and clean sponge according to the requirement. The main thing to keep in mind when using glaze is to maintain a ‘wet edge’ by working in small areas. This means that the glaze should be kept wet until you achieve the desired look. Partners are used by many people in such faux assignments. This makes the work more fun and the desired project is completed quickly while maintaining a wet edge. The work should always be initiated at corners and then spread across the wall. One difficult part of designing an authentic faux design is to make sure that the edges and corners i.e. baseboards and ceilings look similar to the other walls. This can be done by masking the edges and then using a sponge with a flat edge that can be cut into small pieces to cover these small and straight portions.